While engineers were defining the mathematical basis for the design of space tethers and space elevators, science-fiction writers and artists brought the new technology to the attention of a broader public. A Russian volume of paintings by cosmonaut and artist Alexei Leonov and space artist Anatoly Sokolov published in 1967, The Stars Are Awaiting Us, contains a painting entitled "Space Elevator.'' The description accompanying the illustration states that it shows an "Earth-Satellite-Earth'' elevator for freight and passengers that can operate without any rocket propulsion (Fig. 3.3). In 1979 the famous science-fiction writer Arthur C. Clarke published his novel The Fountains of Paradise, which describes the development and construction of a space elevator in the 22nd century. Microscopically thin but ultrastrong "hyperfilaments" made from "continuous pseudo-one-dimensional diamond crystal'' are used to construct the cable. The crystals are produced in space, where gravity does not impede their growth. The epilogue of the book describes the situation some 600 years after the construction of the first connection with space, when Earth is encircled by a giant ring—a wheel-shaped space station that is connected to the surface by several space elevators. 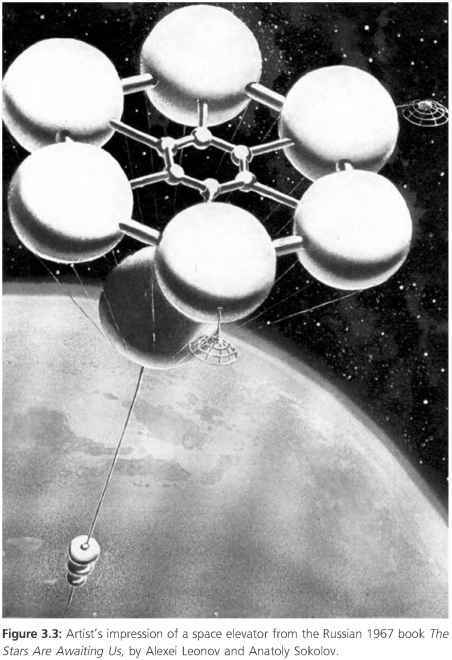 Figure 3.3: Artist's impression of a space elevator from the Russian 1967 book The Stars Are Awaiting Us, by Alexei Leonov and Anatoly Sokolov. All the legions of geostationary satellites could be attached to it, and reached for servicing by an internal circular railroad. And it could serve as a launch platform for almost all missions, manned or unmanned, into deep space. It would be reached, of course, by space elevators, which would take the form of several spokes linking the ring city with the equator. The Earth would, in fact, now be the hub of a gigantic wheel, 85,000 kilometers in diameter. Passengers could move up and down the spokes, or around the rim, just as freely as they now move around the surface of the Earth. The distinction between Earth and space would be abolished, though the advantages of either could still be retained. Nobody can accuse Clarke of not thinking big, but he soon found out that a Russian engineer by the name of Polyakov published a paper with the same idea almost simultaneously, and that Buckminster Fuller came up with the ring concept as early as 1951! Space elevators also feature in Clarke's more recent works, such as Firstborn, a novel he wrote with Stephen Baxter and that was published shortly before his death in 2008. In this book three refugees escape Earth as stowaways onboard a cargo container ascending a space elevator ribbon. They disconnect the vehicle near the top of the cable, so that it is flung away into space for a rendezvous with an interplanetary spacecraft. In the same year as Clarke's The Fountains of Paradise was published, Charles Sheffield published The Web Between the Worlds, which also describes the construction of a space elevator. It included a preface by Clarke explaining that his and Sheffield's book had been written independently and that the authors had not known about each other's book until recently! The science-fiction writer with the most stories about space tethers was the late Robert L. Forward. Apart from the earlier mentioned Camelot 30K (1993) that describes a Space Catapult System, he wrote the books in the Rocheworld series that deal with the use of space tethers for orbiting and de-orbiting spacecraft (including Flight of the Dragonfly, published in 1984, retitled Rocheworld in 1990). Other books featuring tethers are Dragon's Egg (1980), Starquake (1985), Martian Rainbow (1991), and Timemaster (1992). In 1993, Kim Stanley Robinson published Red Mars, in which a captured asteroid is mined by self-replicating Von Neumann nanotechnology machines (Von Neumann machines are named after physicist John von Neumann, who studied the theoretical concept of machines able to build copies of themselves, making it possible to "grow" huge factories out of a small number of machines). The machines multiply and then use the asteroid material to produce and lower a graphite cable 37,000 km (23,000 miles) down to the Martian surface. 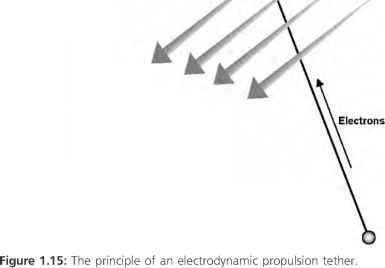 What is left of the asteroid remains in orbit, acting as a countermass for the space elevator. Elevator cars ride up and down the cable, taking several days to make the journey. When the 10-meter-thick (33-foot-thick) cable is later cut by saboteurs at its connection to the asteroid, it twists around Mars at 21,000 kilometers per hour, wreaking havoc on the planet's surface. A Martian space elevator is also sabotaged in Alistair Reynolds' Chasm City (2001) and a similar disaster, but on Earth, is described by Ben Bova in Mercury (2005). In Rainbow Mars (1999), Larry Niven describes a space elevator that is literally a beanstalk, because it exists of a gigantic extraterrestrial tree that extends from Mars into space. David Gerrold, in his novel Jumping Off the Planet (2000), has his protagonists visit a space elevator. Throughout the story technical details on the space elevator system are explained. Many more science-fiction books featuring tethers, usually space elevators, have been published in recent years. Large tether systems are now also regularly featured in comics and cartoons. This is especially true in Japan, where stories about highly sophisticated and futuristic technology are very popular. In the "anime" (Japanese cartoon) series Bubblegum Crisis Tokyo 2040, for instance, a rotating skyhook plays a prominent role. In August 2006, the Japanese National Museum of Emerging Science and Technology in Tokyo started to show the animation movie Space Elevator, based on the Japanese ATA Space Elevator Project and directed by the project leader, Dr. Serkan Anilir. On television, an episode of the Star Trek series Voyager was devoted to a space elevator ("Rise," 1997). Even popular video games such as Halo 3 feature space elevators. Although it is probably the most futuristic and most difficult to develop application, the space elevator now seems to be more firmly established in the popular media than any other space tether technology.